- Astronomers shocked that the Sun and Earth are made from different oxygen. - Evolutionists take Hawking's warning about angry aliens increasingly seriously. - Just add water to the list of the fine-tuning properties in the universe. - While engineers typically can look at the parts of a newly-invented machine (say, a new kind of mobile device) and predict its form and function, but this is not true of anything possessing emergent properties (like water which arises from hydrogen and oxygen); and what is truly astounding is the emergent properties in living cells which, while often compared to computers and machines, in reality make use of computers and millions of machines but are qualitatively very different than either a machine or a computer. - Round Four of Bob's debate with atheist AronRa serves up ice-cream cone shaped fossils, millions of them, that falsify Aron's claim that at the Grand Canyon there is "no indication of rapid stratification." Bob Enyart: Millions of Nautiloids: [from Bob's Round Four debate post] Aron, in the canyon there is a seven-foot-thick (on average) layer of limestone that runs the 277 miles of the canyon (and beyond) that covers many hundreds of square miles which contains an average of one nautiloid fossil every [four] square meter[s]. Many of these nautiloids are larger than your arm, with fossils of tens of millions of these creatures that were buried in an extremely rapid event that killed them all, thus forming yet another important layer of the canyon's walls. Along with many other dead creatures in this one particular limestone layer, 15% of these nautiloids were killed and then fossilized standing on their heads. Yes, vertically. They were caught in such an intense and rapid catastrophic flow that gravity was not able to cause all of their dead carcasses to fall over on their sides. I have interviewed the scientist who discovered the mass burial site. He has worked in the canyon at the invitation of the U.S. National Park Service, and is the world's leading expert on nautiloid fossils. As is true of many of the world's mass fossil graveyards, this massive nautiloid deposition provides indisputable proof of the extremely rapid formation of a significant layer of limestone near the bottom of the canyon, a layer like the others we've been told about, that allegedly formed at the bottom of a calm and placid sea with slow and gradual sedimentation. But a million nautiloids standing on their heads would beg to differ. Anyone should be able to agree that this is what is considered hard evidence of rapid stratification. Well, how about the nautiloids? 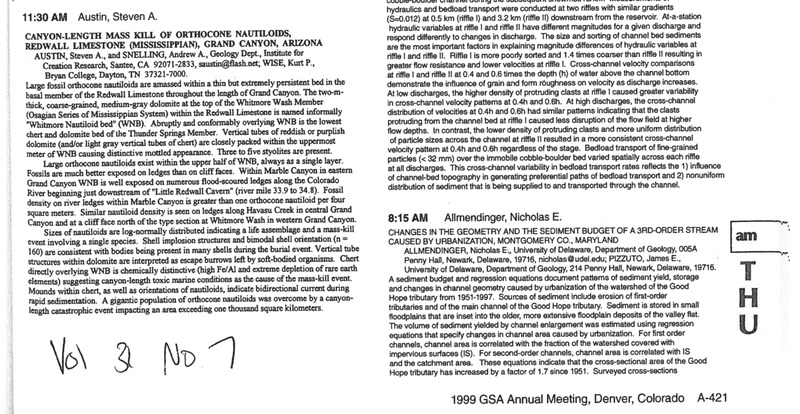 * Geological Society of America Abstract on Nautiloids: See also the Canyon-Length Mass Kill of Orthocone, Nautiloids, Redwall Limestone (Mississippian), Grand Canyon, Arizona abstract from the GSA's 1999 Denver meeting. 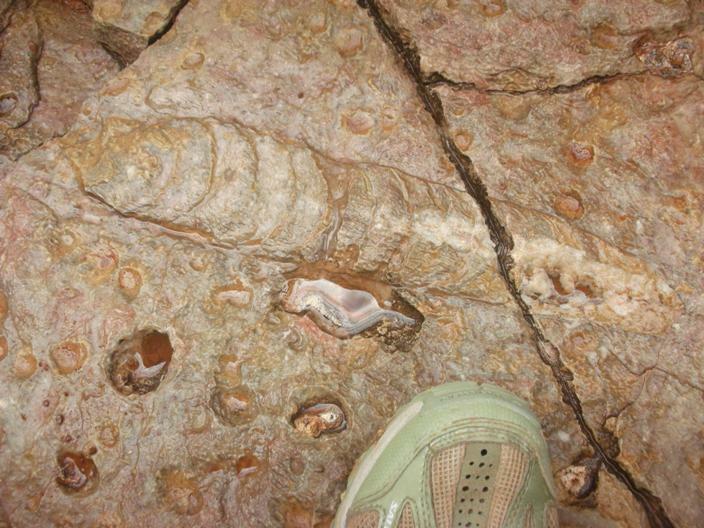 "Large fossil orthocone nautiloids are amassed within a thin but extremely persistent bed in the basal member of the Redwall Limestone throughout the length of the Grand Canyon. ... Large orthocone nautiloids exist within the upper half of WNB [the informally named Whitmore Nautiloid bed], always as a single layer. Fossils are much better exposed on ledges than on cliff faces. ... Fossil density on river ledges within Marble Canyon is greater than one orthocone nautiloid per four square meters. Similar nautiloid density is seen on ledges along Havasu Creek in central Grand Canyon and at a cliff face... in western Grand Canyon. ...orientations of nautiloids, indicate bidirectional current during rapid sedimentation. A gigantic population of orthocone nautiloids was overcome by a a canyon-length event impacting an area exceeding one thousand square kilometers." * A typical disagreement with atheists over nautiloids: The discussion started regarding the ability of manganese nodules to form rapidly, and then it turned to nautiloids. At the Chicago Cubs forum no less, check out how conversations with atheists typically go, from Bob Enyart's post #633 to post #654 in his dialogue with Buckyball and montalvus. * The Written Debate with Atheist AronRa and Creationist Bob Enyart: Continue reading Bob's post in Round Four in this great creation/evolution debate on the British website League of Reason! Today’s Resource: Have you browsed through our Science Department in our online store? Check out especially Walt Brown’s In the Beginning and Bob’s interviews with this great scientist in Walt Brown Week! You’ll also love Dr. Guillermo Gonzalez’ Privileged Planet (clip), and Illustra Media’s Unlocking the Mystery of Life (clip)! You can consider our BEL Science Pack; Bob Enyart’s Age of the Earth Debate; Bob's debate about Junk DNA with famous evolutionist Dr. Eugenie Scott; and the superb kids' radio program Jonathan Park: The Adventure Begins! See this nautiloid information also at YoungEarth.com!